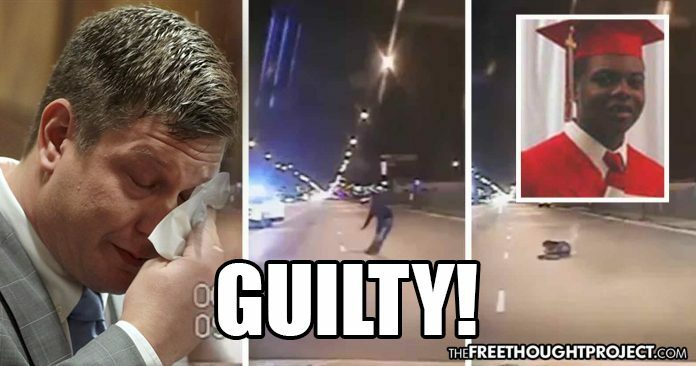 Chicago, IL – After nearly 4 years, former Chicago police officer Jason Van Dyke has been found guilty of 2nd degree murder and 16 counts of aggravated battery with a firearm after shooting and killing 16-year-old Laquan McDonald. Van Dyke plead claimed he ‘feared for his life’ that fateful night, as the unarmed teen walked slowly down the street. However, the video of the incident was so damning that the cop was actually charged. Before McDonald’s family could even file a lawsuit, the city gave them a $5 million settlement on the condition that the family agreed not to publicly release the dashcam footage of the teen’s death. After suppressing the video for 13 months, the city received a court order to release the footage. The city released the dashcam video in 2015, which clearly shows McDonald did not lunge at the officers before the fatal shooting. Although 86 minutes of the surveillance video have gone missing, including the moment that McDonald was gunned down, Cook County State’s Attorney Anita Alvarez claims no one tampered with the footage. Unable to clearly explain why the 86 minutes disappeared, Police Supt. Garry McCarthy blamed the missing files on technical difficulties. At a press conference, Cook County State’s Attorney Anita Alvarez asserted that no one had tampered with the Burger King surveillance video. When asked who conducted the forensic testing, Alvarez did not appear to know the answer. Although the police department and state’s attorney claim the officers did not delete those 86 missing minutes, remember that this information is coming from the same cops who initially lied about the shooting and the same officials who suppressed the police dashcam video for 13 months. The death of Laquan McDonald has been the impetus behind police reform across the country as well as in Chicago. Following the controversy surrounding his death the city of Chicago was forced to release years of police brutality videos, showing the horrifying abuse of the city’s citizens by their ostensible protectors.